Some days it's pretty easy to write this blog. Today is one of those days. It wasn't just easy today, it was embarrassingly easy. There was no searching for a car or any real writing involved in today's post. 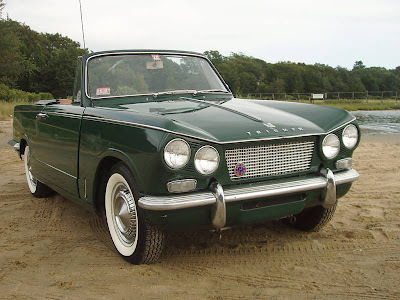 The Triumph Sports 6 Vitesse is a compact six cylinder car built by Standard-Triumph from 1962 to 1971. The car was styled by Michelotti, and was available in saloon and convertible variants. The Triumph Vitesse was introduced on 25 May 1962, and was an in-line 6-cylinder performance version of the Herald small saloon. The Herald had been introduced on 22 April 1959 and was an attractive 2-door car styled by the Italian designer Giovanni Michelotti. By the early 1960s, however, Triumph began to give thought to a sports saloon based on the Herald and using their 6-cylinder engine. Michelotti was again approached for styling, and he came up with a car that used almost all body panels from the Herald, combined with a new front end with a slanted "Chinese Eye" 4-headlamp design. Standard-Triumph fitted a 1596 cc version of their traditional Straight 6 derived from the engine used in the Standard Vanguard Six, but with a smaller bore diameter of 66.75 mm (2.628 in), compared with the 74.7 mm (2.94 in) bore on the Vanguard, equipped with twin Solex B32PIH semi-downdraught carburettor These were soon replaced by B321H carburettors, as the accelerator pumps proved a problem The curious observer will notice a "seam" on the cylinder block between the third & fourth cylinders revealing the humble design beginnings from the 803 cc Standard 8 block of 1953. The gearbox was strengthened and offered with optional Laycock De Normanville 'D-type' overdrive. Front disc brakes were standard as were larger rearbrake drums, and the Herald fuel tank was enlarged, retaining the handy reserve tap of the smaller Herald tank. The front suspension featured uprated springs to cope with the extra weight of the new engine, but the rear suspension was basically standard Herald—a swing axle transverse-leaf system which quickly proved inadequate for the relatively powerful Vitesse. The chassis was basically the same as the Herald, and the Vitesse was available in convertible and saloon forms; a coupe never got beyond the prototype stage. A handful of Vitesse estates also were assembled to special order at Standard-Triumph's Service Depot at Park Royal in West London. 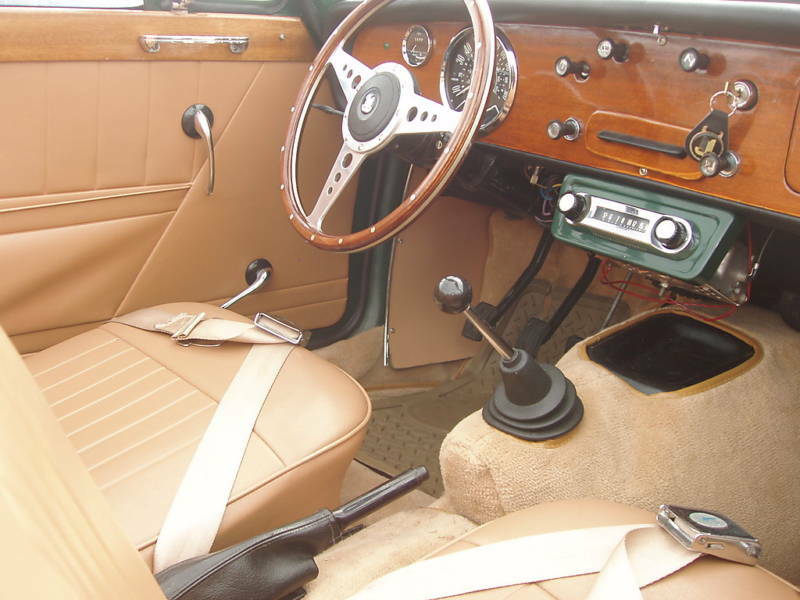 The interior was much improved over the Herald; wooden door cappings were added to match the wooden dashboard and the car featured better seats and door trims. Exterior trim was also improved with stainless steel side trim and satin-silver anodised alloy bumper cappings (replacing the white rubber Herald design). The Vitesse 6 convertible was exported to the United States as the left-hand drive Triumph Sports 6, from 1962–1964, and was marketed as a "limited edition car", but due to its retail price only 679 were sold in the U.S. before it was withdrawn. The Sports 6 was perhaps better suited to American highways than was the Herald, but it faced stiff price competition from cars such as Ford's new Mustang. The Vitesse Saloon was not officially imported to the U.S., although a few do come up as P.E.D. (Personal Export Delivery), cars usually imported by American service personnel. Original U.S. price (POE East Coast) was $2499 for the Sports 6 Convertible. As the seller notes, less than 700 of these cars were sold in the US. With Triumph's TRs and Spitfires (desrvedly) getting attention by collectors and sports car fans, few people thought about restoring a Sports 6. I'm glad this guy did. It's great to see this car in this condition. I doubt there are many others (if any) like it. If I had the extra room and the extra cash, this car would be mine. 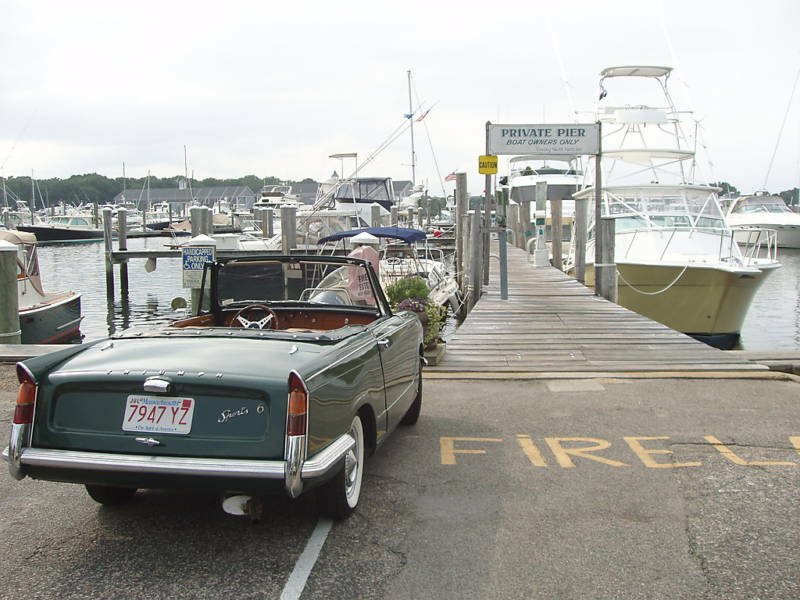 Located on Cape Cod, MA, click here to see the eBay listing. Thanks again to Blair for sending me the link to this incredibly nice car. Hey, you're welcome. I happened to stumble across it on eBay and figured it would be perfect for this site. It's like how I stumbled across this site just a few days ago while looking for some info on a car. I became addicted and I've gone through the past few months looking at all the posts. 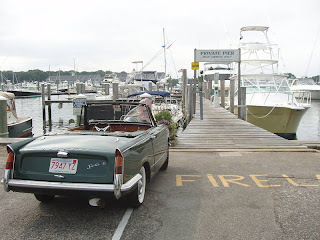 It's a great site written in an entertaining manner and as a quirky guy myself, I've enjoyed reading about all the obscure/underappreciated in the U.S. vehicles. I've always driven typical cars (most of which were beaters; my current one, though, is a Mazda 3) but I wish that in my teens/early 20's I could have driven a Peugeot 505 or an Alfa 164 instead of an Olds station wagon or a Chevy Beretta. Oh well. Like I said, I'm now addicted to the site and I'm glad I was able to help out already. Sensational car! So rare! I think the lowly Herald (I think we called it 1200 here instead) convertible sold for only $1998, and the sedan was about $1698. Was the performance of the "6" comparable to, say a Corvair Monza, for about the same money? There weren't really a lot of small convertibles but Beetle, Karmann Ghia, Caravelle, BMW 700, DKW Junior, Minx, Minor, Felicia, and much more practical than a sports car. BRAVO for saving this one!